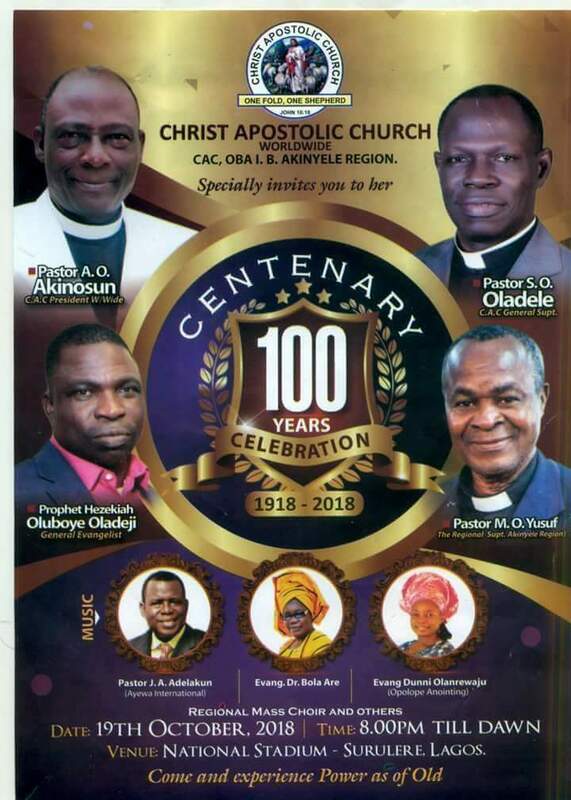 All roads lead to National Stadium, Surulere Lagos today Friday October 19, 2018 for Christ Apostolic Church Akinyele Centenary Revival and Celebration by 8pm. CAC Akinyele Region comprises of Lagos and Ogun states. 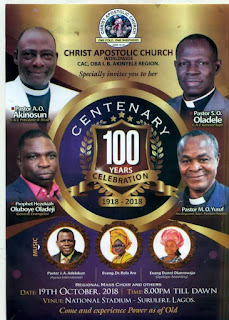 CAC Centenary Revival started two weeks ago at the Port Harcourt centre which comprises of Hanson, Odusona and Olutimehin regions, and Abuja centre which comprises of Medaiyese and Adelaja Regions. The authorities of the church being lead by the President, Pastor Abraham O. Akinosun, General Superintendent, Pastor Samuel O. Oladele and General Evangelist, Prophet Hezekiah O. Oladeji will minister through the inspiration of the Holy Spirit at the programme. "100years of Walking With God" is the theme of the anniversary which will be celebrated across all the regions of the church before the grand finale in Ikeji-Arakeji Osun State. CAC NEWS will be reporting LIVE from Lagos this evening. You can LIKE our Facebook page (CAC NEWS) to get live update.